Matthew Palentine is a private Art Consultant from Manchester. 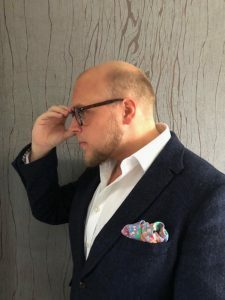 Over the last five years he has worked with companies and private collectors from all over the world to build incredible investable art collections. In Spring 2018 he will be opening his first permanent gallery space in the heart of Manchester, exhibiting some of the most interesting artist of our generation. When people ask me about collecting art, I always start with a simple question – why? Why do you want to collect? People start collecting for numerous reasons; investment is always a common reason, but rarely the only reason. Buying for investment can be harder than you think, but doing plenty of research and following a number of simple steps before buying is key to building a successful collection. Companies of all sizes and people from all walks of life are now investing in art. Why? The simple answer is – because it’s exciting. Many people are investing their money in stocks and shares, but let’s be honest, how enjoyable is it. Yes, it’s great when you see a stock go up one day, but it’s depressing when you see it drop just as quick the next. Collecting art doesn’t come with the same anxiety and can have more than monetary benefits. There are two types of collectors – public and private. Both choose the art they buy for different reasons. Initially people start just to decorate their walls, but you become a collector when it goes beyond decorating and you collect with other intentions (education, social, emotional, status and investment). Be warned, collecting can become addictive, however it’s a positive addiction that can be enjoyed, it provokes conversation, inspires and if done successfully can be great investments. Most private collectors buy with emotion; the art they choose comes from deep within and projects a person’s true personality. The clothes they wear, the way they behave and share opinions all express individuality, but art does something more, it portrays a private and honest character. Most private collections are just that – private, only select people get to see them, so private collectors aren’t afraid to express boldly with their art. Public collectors (companies who display art in their work places for the public to see) collect for different reason. Yes, investment is a factor, but it goes beyond that. Art can portray status and can express how successful a company is. It can underpin the values of their brand and even educate or inspire their customers. Whether you are a public or private collector, it’s important to understand a number of things. Over the last number of years, I have shared with my clients a few essential things to address before buying and I can proudly say I have helped build some amazing collections. BUY WHAT YOU LOVE – always buy with your eyes and not with your ears. If you like it, it’s likely others will too. INSIGHT – research the artist and their market as best you can. How do they market themselves? Who sells their work? How prolific are they? This list can go on. BUY AT THE RIGHT PRICE – Understand as much as you can about the market, it’s important to understand their secondary market too, as this can drive the value of artwork. SELL AT THE RIGHT TIME – occasionally you have to sell works, it’s hard to part with pieces sometimes, but knowing when to sell is important too. Markets do change. SOURCE – this is important, know who you are buying from, build relationships with people (people buy from people) and always get the provenance and authenticity of works you are buying. I created Grey Space as an avenue to not only celebrate the art I enjoy, but to work with clients to build incredible investable collections. I specialise in a niche market, as the art market goes, but represent the fastest growing art movement in history – Contemporary street art. I love sharing my passion with my clients and I think they would agree, every part of the collecting process can be enjoyed. Wondering around galleries, researching the artist, knowing what you like is only the start. As a collector myself, my favourite bit is always receiving and unpacking the piece, and hanging it on my wall. It takes me back to being a child, ripping open presents on Christmas day and building Lego sets with my dad. Who doesn’t want to relive that? I would also say try to enjoy collecting art like so many do. 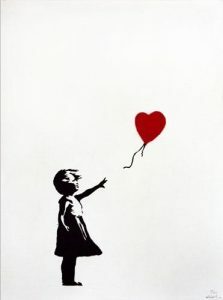 It’s a great world to be exposed to and one day you may buy the Holy Grail, like many did with Banksy’s – Girl with balloon in 2004, costing just £150, that same piece now fetches over £90,000. If you are interested in collecting, have any questions or just want to talk art, please don’t hesitate to get in touch. Alternatively, email ‘SUBSCRIBE’ to info@greyspacegallery.com, to subscribe to our newsletter and be the first to hear about our gallery opening, exhibitions and new artist insights.